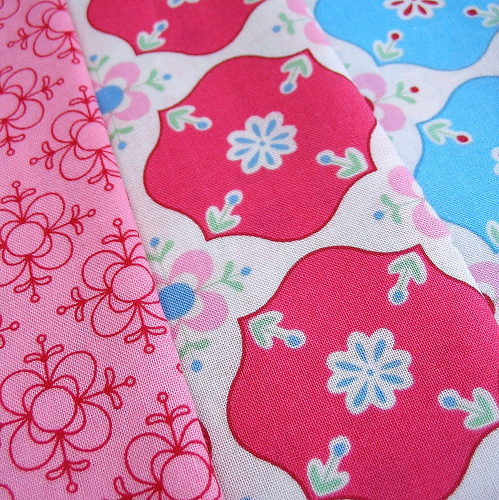 Today Sunday Stash is brought to you by "Grandmother's Flower Garden" by Lecien designed by Rosalie Quinlan. Rosalie is an Australian pattern and fabric designer, and also teaches right around Australia. The full range of fabrics can be seen here. 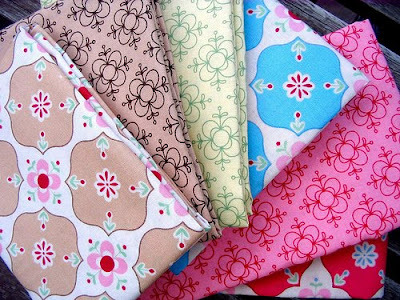 I purchased these fat quarters at the Craft Expo in Melbourne which was held 8 - 11 Oct, 2009. This much anticipated fabric range is sure to be arriving at a store near you soon. I think these prints are going to be vey handy. I was so excited when I walked into my local and they had the FULL range. I got the cute little pink and red hexies. Those are so pretty. First thing that came into my head when I saw them was Pennsylvania Dutch Country with the designs painted on the barns. I have been waiting for these ones! Thanks for the preview - they are lovely! I am just getting into sewing and quilting. To have any suggestions on how to go about building one's stash? Your quilts are so inspiring! Thank you for providing and lovely place to come and dream! Also I'd be curious to know what sewing machine you use. Thanks for all your guidance!!! Fabric envy! They are just lovely! Great fabric! It's good to find Aussie fabric designers. Very nice fabric. I love your quilts! Gorgeous! I love Lecien!! That fabric on the top in the first picture is my favourite of the lot. Ooooh, they're beautiful! Thanks for the peek for those of us that don't have them yet!